Australian Transport Systems repair and recondition off-road truck and railway locomotive braking resistors/grids and supply new resistors/grids from Mosebach – a world-leading manufacturer and supplier of dynamic braking resistors. ATS proudly represent IBEG GmbH in Australia, New Zealand and South East Asia, manufacturers of rail traction sanding systems and railway platform access ramps, bogie test rigs and a range of associated products used throughout the transit rail industry. ATS also supply IBEG spare parts and perform IBEG Warranty repairs. 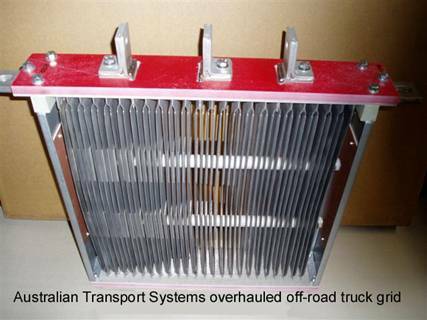 braking resistor grid reconditioning by Australian Transport Systems.